Welcome to a place where tradition and progress meet. Rich in agricultural heritage and suburban lifestyle, Georgetown is one of the fastest growing areas in the state, home to Georgetown College and Toyota’s largest manufacturing facility outside Japan. 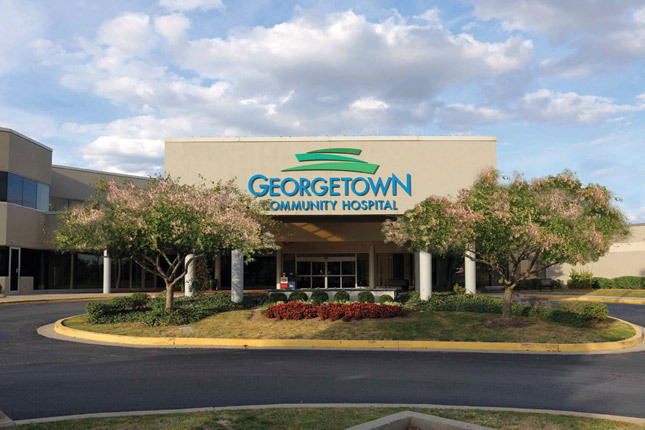 Georgetown Community Hospital is a 75-bed acute care facility with an award-winning history of providing excellence in healthcare. Georgetown Community Hospital has been named a “Solucient 100 Top Hospital” three times in recent years, and won Best Places to Work in Kentucky five times in the past six years. The hospital continues to add new medical services and grow the number of specialist and primary care physicians. It also features a newly renovated, 6-bed ICU, a Med/Surg Unit and a 24-hour Emergency Services Department. State-of-the-art equipment includes MRI, Lithotripsy, two CT Scanners and Ultrasound. Medical services include Allergy, Anesthesiology, Cardiac Rehab/Cardiology, Dermatology, Gastroenterology, Hematology/Oncology, Family Practice, Gynecology, Internal Medicine, OB/GYN, Occupational Therapy, Ophthalmology, Otolaryngology, Pathology, Pediatrics, Physical Therapy and Sports Medicine, Podiatry, Radiation Oncology, Radiology and Urology. Surgical services include: Bariatric (Weight-Loss), Colon-Rectal, ENT, Gynecological, Orthopedic and Urology. A recognized Center for Excellence, the Bariatric Center offers a minimally invasive weight loss surgery program, which was named a Top Five national program by Obesity Help magazine. Highly noted for its historic homes and perhaps the best antique shopping in the state, Georgetown is also known as one of the state’s fastest growing cities. Located at the crossroads of I-75 and I-64, it is ideally located just 10 miles north of Lexington, the Horse Capital of the World. Two larger cities, Louisville and Cincinnati, provide quick access to arts, entertainment, shopping and professional sports. Georgetown was founded by the Baptist minister Elijah Craig in 1790, best known for his world-famous invention, bourbon whiskey. Today, Georgetown is proud to be the American hometown of Toyota’s Camry, Venza and Avalon production facility as well as host for the Cincinnati Bengals’ training camp, which is held each August at Georgetown College, a four-year liberal arts school. Additionally, the University of Kentucky, Transylvania University and Midway College are all located in the surrounding area. Georgetown is located in the heart of Kentucky’s famed Bluegrass Region. This is horse country, and the area’s back roads offer beautiful scenery with horse farms, cattle fields and Irish fieldstone fences. Steeped in tradition and just 10 miles down the road in nearby Lexington, Keeneland Race Course attracts people from around the world for their yearly meets in April and October. At the Kentucky Horse Park, visitors can watch a harness maker at work, enjoy the parade of breeds or take a horse-drawn carriage tour. Historic Elkhorn Creek offers world class canoeing and fishing. There are dozens of golf courses in the area, including Cherry Blossom, Canewood Golf Course and University of Kentucky golf course.